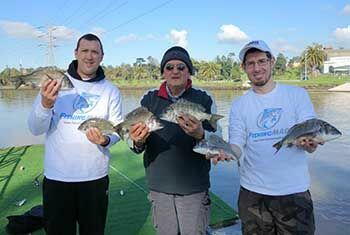 Great morning on the Maribyrnong River by Team FishingMad ( Alan Bonnici, John Regali, Mark Moseley & Jeremy ang ). The weather was perfect, calm winds the sun shinning and hot air balloons flying above. Despite the really dirty water the Bream & Mullet were on the bite with many size Bream caught and Mullet caught in massive numbers. The most productive bait was Maggots on a small hook, traditional baits such as Pilchards, Chicken, Mussels and Prawns only getting the occasional bite. The biggest Bream and Mullet both measuring 36 cm. Was a great morning shared by the team.